Now, special for Sefira, Yossi has been working on a new composition. This new song titled “Horachamon,” is a Hartzig Nigun whose lyrics talks about the rebuilding of the Beis Hamikdash. It is said every night after counting Sefira. Yossi actually composed the song during sefira a few years ago, while davening at the Kosel one Friday night. 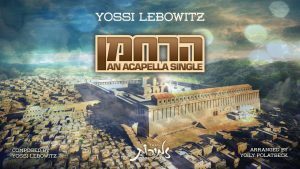 Yossi wanted to keep the song’s authenticity, since the song is being heard for the first time in Acapella. That is when he approached singer, arranger and choir master Yoily Polatseck of the Zemiros Group to help produce and arrange the track. Yoily agreed, and kept the songs arrangement as simplistic as possible, to allow for the beauty of the song to shine through on its own. The harmonious voices of Zemiros group coupled with Lebowitz’s simple yet Hartzig vocals are sure to have you singing this Nigun as we’re yearning for the Bayis Hashlishi.